2016 at Youth Alliance was marked with strengthening of old relationships and beginning of some new ones as we came together at 5 years celebration of Youth Alliance. One thing that came up strongly in the celebration was the proposal for more space to meet as a group. One of the ideas that germinated gave birth to Action Learning Saturdays, which is one weekend day every month held for our alumni to do a host of things together from day-long learning journeys to a movie together to visit any organization for a group discussion or leadership circle. It also becomes an opportunity for non-alumni to come in YA circles and share the experience. Action Learning is an initiative to invite and engage all YA alums in order to continue their learning and open our door to non-alums as well. India saw a massive rise in the number of social sector fellowships in the last decade – making service to society as a lucrative career option for youth. Hundreds of such fellowships have brought thousands of young talent into the sector. As thousands of young people become part of the social sector fellowships, most of them come in with idealism to create change and incur huge opportunity costs of leaving corporate career; there is a growing observance of mental health issues and inner imbalance in this population segment. This leads to deep consequences not only on their personal well-being but also in the social impact they create by wounding their ability to bring values to their work. This Action Learning, we are coming together to talk about the crisis where caregivers need care. For the social sector in India, to sustain committed people to work on complex issues over a long term it is important for it to invest in their emotional-inner well-being. 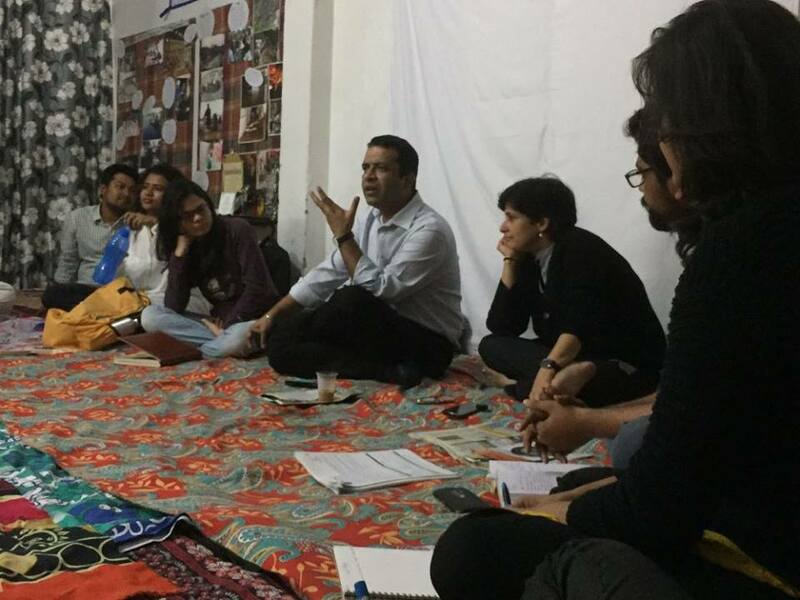 The first ALS happened with one of our alumni, Vijay who runs an organisation called Jagriti in Katputli Colony slum in Shadipur, where 12 communities comprising artists from different states of India live. On the day, we witnessed communities struggle to get dignified residential area from the government. And Jagriti’s effort to become a bridge between the two. It was here that it felt the intensity of values being practised by one of our alumni - only strengthening our belief in what we do. Learning. Colours. Ownership. Gratitude! These were some of our reflections at the end of our action packed Action Learning Saturday with @thelabhyafoundation Our day began by sharing a circle with Team Labhya, a group of committed artists, designers and architects in the making, who chose to dedicate their creativity and souls to Project LAPE. The idea behind Project LAPE is to make government schools an enriching experience in entirety. We experienced the energy and values that have extended their way through two alums of Youth Alliance, Richa Gupta and Vedant Jain. From mixing colours to painting to immersing ourselves in the culture of Labhya, we experienced the ripple effect first hand, yet again! Goonj which some of us call living monument of social change in India, would have been a pilgrimage spot for Action Learning. 25 of us who came together in February were awestruck by the attention to detail that was given by every member of the Goonj family to their work. Anshu Bhaiya and Meenakshi Didi shared their thoughts on the 18-year exceptional journey with Goonj, from it's birth to it's growth. They spelled out the telling reality of our ecosystem and how dreams matter the most. Kat-Katha supports women and children living in the brothels of GB Road to create a better future for themselves. Each of us were made aware of the 'pyaar ka mohalla' as Geetanjali didi likes to call it, that existed in the cramped little worlds up the dark stairs. The love and concern that the didis showered on us was so humane it left not one of us untouched. From offering food to inviting us to rest after being exhausted in the sun, the decked up didis in their shimmering clothes were figures of motherhood. We all walked up home a little richer that day, with a little more love in our beings, our smile wider, our hearts warmer. GB Road is indeed a 'pyaar ka mohalla'.